In 1975, I graduated from Bondelagets Folkhøgskole in Mysen, Norway. In 2015 I visited Norway for my fortieth reunion. It all feels like so much less than forty years ago. The new normal for air travel seems to involve a lot of difficult flight arrangements. I started my trip from OKC with a four hour delay. Since that meant I could miss all my other connections, I managed to get on another flight, routed through another city. However, by the time I made Minneapolis, my next flight out had an eight hour delay posted and it looked like I would arrive more than a day later than planned. Some quick thinking on the part of one of the gate agents put me on a flight to Amsterdam that had already started boarding. I made it to Amsterdam and had to change to yet another flight to Oslo. I finally arrived about two hours later than my original schedule. Things could have gone much worse. Tittei and Krisgeir in the kitchen at her farm. Tittei Lunder, my always reliable airport pickup person for reunions, met me at the airport. Hearing Norwegian again after all this time gave me the oddest sensation. It felt like I heard everything underwater. It didn't even sound like a real language, though I seemed able to translate it in my head. Listening to Tittei talk was exhausting and completely mind numbing. At Tittei's house that evening, I met Håvard, her nærboer. (Norwegians have a name for every possible living arrangement.) Krisgeir Sigurgeirson, the student from Iceland when I went to school, came over for dinner. I also got to chat with Tittei's son and mother. Her mom said she still remembered me from school, plus she remembered my family from when they visited her farm during the twenty fifth reunion. I remembred her, too. She seemed just the same after fifteen more years. We had a great dinner, but I hardly remember it. I felt tired, struggled with the language, though that got better as we went along, and by 11:00 the sun didn't look like it would ever go down. Tittei's mom stayed around to do the dishes while the rest of us visited. Apparently, she lives to do kitchen work, and Tittei says any day that she comes over to cook and clean seem like a great day to her. Eventually, I had to excuse myself and head for bed. I hardly remember hitting the bed, but I felt much better the next morning. Early the next morning Tittei, Krisgeir, and I piled into her car and headed for our hotel in Hønefoss. We had a quite a good turnout considering. The only person I missed was Randi, but to my delight she showed up a few hours later. The most interesting observation about the reunion, besides the standard tropes about how old everyone had become (in this case they really did seem to have aged more than me...), was how many people had stopped smoking and their partying had certainly scaled back. It seemed like most of the people there had decided that at their age they should not smoke anymore. Brit Elon and Randi had both stopped smoking, something I never expected could happen! And unlike other reunions, the drinking seemed to be more social that competitive. That made for a lot more talking that other get-togethers. We had a number of interesting activities in the area. We visited an old mill that had been restored and looked at the beautiful views in the area. We also had a very nice lunch in one of the local restaurants associated with the old mill. For our final evening we had a big dinner celebration. The food was wonderful and artfully prepared. We followed it up with a very nice evening. Dana had decided not to come, but that evening I called her at home via FaceTime. I am the only one at school whose spouse knows lots of the students from my school. Everyone went out of their way to video chat with her. It's really pretty impressive how many of my friends she knows and how excited they were to talk to her. Jarle and I left the next day for Jæren. Not from from Hønefoss I spotted a stave church and Jarle agree to pull over. Ever since I saw my first one, the old churches have fascinated me. I don't think anything is more unique to Norway or more quintessentially Norwegian. This one was in excellent condition - I think they were still using it for services - and sat in a lovely cemetery. It was one of the high points of my trip. Somehow we took a wrong turn or didn't do a good job planning our route and we ended up in some of the most desolate country I have seen. Even in mid-June, we saw snow and bogs and very little living vegetation. It was cool and creepy, like something out of a really scary horror movie. Even when we found our way down, we still drove through thirty foot snowdrifts beside the road. Once we finally made it to Bryne, Jarle was pretty excited to show off Frank, his new automatic mower. He had it all set up so he would not ever have to mow again. Frank would just start up on his own and take care of things. Two days later when visited the family farm his brother runs, I got to meet Frank's older brother who cuts the grass all over the farm. I wish I could remember the mower's name. It was something very literary. 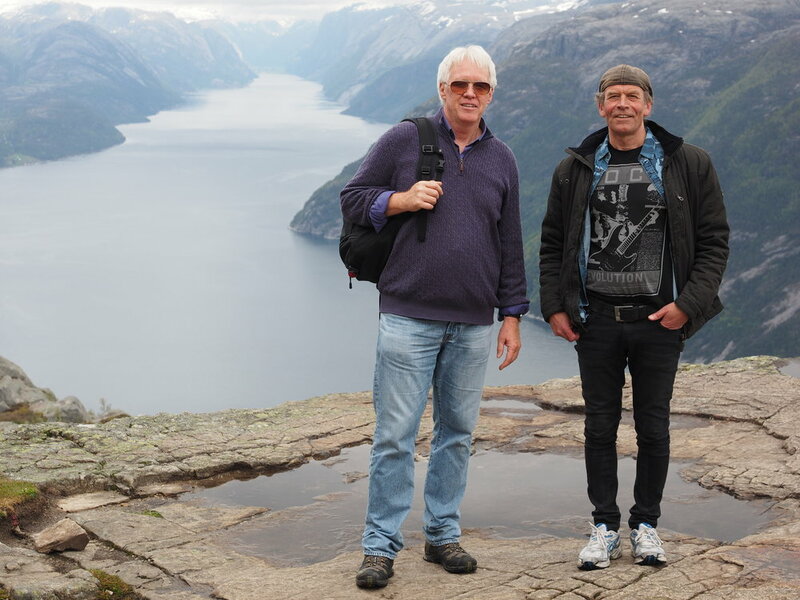 For our big adventure, Jarle took me to climb Preikestolen (Pulpit Rock). It was probably a five kilometer climb up some fairly challenging trails. it was very different from anything you would find in America. The trail had no guard rails anywhere and was sometimes quite narrow. At one point, the trail narrowed to about a foot wide with a big drop off the edge and included a nifty gap of about eighteen inches with nothing under you at all. No one seemed to have any issues with it, but in the US it would have caused a lawsuit. Preikestolen is phenomenal. It juts out over the fjord about a mile above the water and gives an unobstructed view of the area in three directions. It is one of those places you see people sitting with their legs over the edge. It looked fairly safe, though you would not want to fall. The whole thing gave me the creeps; I crawled to the edge to look over, but had no desire to hang any part of my body over. Jarle has a very serious fear of heights and was very brave to climb up there and hang with me. He never made it close to the edge, but he made it up. Jarle has a new girlfriend, Nina. She's a very nice person who clearly wanted to impress Jarle's American friend. She was was so focused on speaking English with me that it took her several minutes to realize that I was answering her questions in Norwegian. Jarle had told her that I was fluent, but she either didn't hear him or didn't really believe it. Once we got past the language, things went pretty well. Jarle dropped me off the next morning at the airport outside Stavanger. Security was a whole different thing there. I showed up and scanned my passport. Their machine printed my ticket. I went through a very liberal scanning station and I was in. Couldn't be easier. It's always good to see Jarle. He really hasn't changed much, and I just enjoy hanging with him.